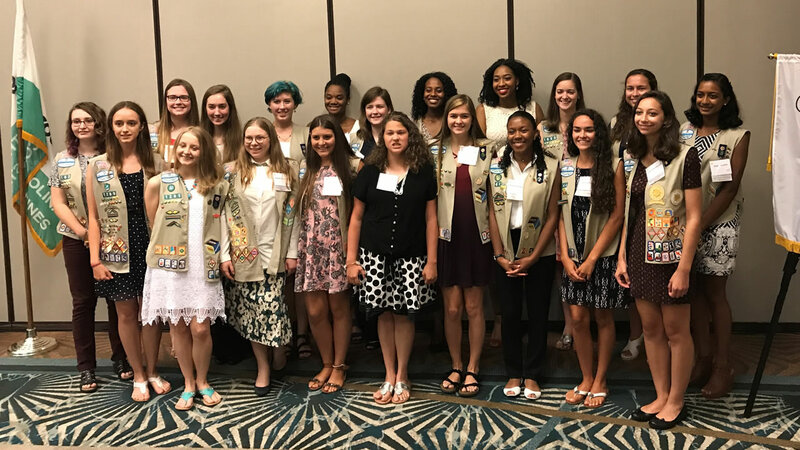 RALEIGH (WTVD) -- Young women of the North Carolina Coastal Pines Girl Scout Council gathered Thursday evening in Raleigh to receive the highest honor awarded in Girl Scouting. The awards for 2016 mark the 100th anniversary of the first year the prestigious Girl Scout Gold Award was offered. The Gold Award is earned by fewer than 6 percent of Girl Scouts each year. To be eligible to receive it, you must be in grades 9 through 12 and demonstrate "extraordinary leadership through sustainable and measurable 'Take Action' projects". The projects can take upwards of two years to complete and highlight the participant's leadership, planning, and organizational skills. This year 71 Girl Scouts in the Council will receive the award. Their projects address issues of domestic violence, healthy eating, protecting the environment, providing emergency medical assistance, and various STEM initiatives. You can read about all of the projects here. Lisa Jones, the Executive Officer of the Coastal Pines Council, presented the awards at the July 13 dinner. Jones spoke of her pride in each of the honorees who completed projects. "I am confident that the work they have done in their communities to earn the Gold Award will inspire further success in their lives as they move forward to college, careers, and a life built upon the principle of taking action to make their world a better place," she said. 26,000 girls and 9,000 volunteers make up the 41 County Coastal Pines Council in central and eastern North Carolina. Thursday night's ceremony was for recipients near the Triangle. Similar celebrations will take place in Greenville and Wilmington. To volunteer, reconnect, donate, or join visit the Council's website or call (800) 284-4475.